The article then continues by saying that this “obscure concept begins on the options desks of Wall Street” and includes an explanation of why producers buy puts to hedge their production and also some of the risks involved in being on one side or another of this trade. Since the Bloomberg article was written largely as a post-mortem, the question retail traders might ask themselves is: “how can I spot this kind of aberration in advance?” The article does not provide a definitive answer to this puzzle, however we can provide some clues. On October 3, 2018, WTI crude oil hit a 2018 settlement high of $76.40 per barrel. At that time the NYMEX WTI options market was pricing in an October 17th option expiration settlement value in the low $70s and a November 14th option expiration settlement value in the low $60s as shown below in blue and red(and as published in our daily report). Prior to the sell-off in crude oil which began on October 4th, the levels of delta- and gamma-neutral provided a reliable point of mean-reversion for the WTI futures price for at least the preceding four months. In the chart above this is shown as the oil price (green) traded at the model magnet (black square) which is predicted by neutral delta and gamma. To add to the ammunition, the November 14th option expiration was for the December futures contract, which, as the anchor and/or primary contract for many producer hedges, increases the volume of the particular contract. To simplify the concept, we can think about the gamma imbalance as follows: producers had locked in a significant amount or sold a significant amount of crude oil in the low $60s – either by selling call options or by buying put options. These trades created pressure for the order flow in both the futures and options markets to mean-revert to this lower level. 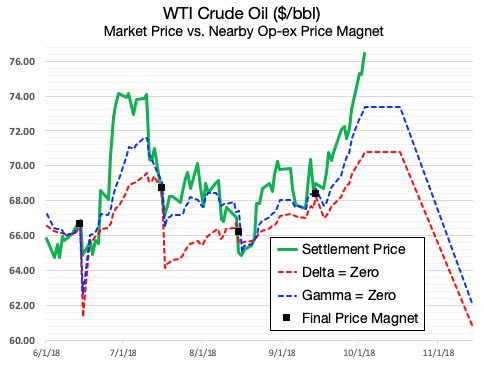 Our charts clearly showed this massive imbalance in the stark difference between where the price of oil was (green line) and where delta and gamma (red and blue) implied it would be in the future. In hindsight, the crude oil market breached $60 and then $50 per barrel level to the downside. While we will never know the ultimate catalyst that sparked the sharp selloff, both Bloomberg and I believe that this massive imbalance played a role. The majority of financial market trading is performed by machines. Computer algorithms are designed to arbitrage and hedge the markets along many different time frames. As option expiration approaches, the computer algorithms must unwind and roll forward their delta hedges. This creates order flow that tends to compress market delta and market price. The price of a stock index or commodity will often revert to the point of delta-neutral. The mean-reversion is seen above as the relationship between the red and green lines on the option expiration date, which we call the Final Price Magnet. The algorithms which actively and instantaneously hedge delta must also monitor their gamma exposure. When gamma spikes, covering events may occur, such as occurred in the natural gas market (Oct 2018) and in the S&P index (Dec 2018). The example provided in this article is extreme but it is worth highlighting as it shows the value of tracking market delta and gamma. The financial media can be quick to assign blame or credit for every squiggle up and down in the financial markets. Sometimes the media is correct, but frequently there are advance clues that professional traders understand better than the media. Understanding what drives the market makers can improve your odds of successful trading. The Price Magnet Report is a tool that considers order flow and open interest in the options markets to calculate expected mean-reversion in and around the option expiration date. Our daily report includes over a dozen key stock indices and commodities. This daily report provides intelligence that Bloomberg says is meaningful, but you can’t access this information on CNBC, or even on the Bloomberg terminal itself. I look forward to any feedback on these concepts in general, or on the oil market in particular. Erik Lytikainen, the founder of Viking Analytics, has over twenty-five years of experience as a financial analyst, entrepreneur, business developer, and commodity trader. Erik holds an MBA from the University of Maryland and a BS in Mechanical Engineering from Virginia Tech. You can see more of his work at: www.viking-analytics.com. Quick Take: Volatility Ahead in the Oil Market? Will The Pound Get Pounded? Erik Lytikainen, the founder of Viking Analytics, has over twenty five years of experience as a financial analyst, entrepreneur business developer and commodity trader. Erik holds an MBA from the University of Maryland and a BS in Mechanical Engineering from Virginia Tech. You can learn more about his work on his website: www.viking-analytics.com.